The Jewish Quarter and St. Procopius Basilica of Trebic bear witness to the coexistence of and interchange of values between the Jewish and Christian cultures from the Middle Ages until the Second World War. The St. Procopius Basilica originally was constructed in the 13th century as part of a Benedictine Abbey. It is made of granite and sandstone, and has both Romanesque and early Gothic features. The existence of the Abbey at this site stimulated the development of a marketplace, which attracted among others also Jewish merchants. 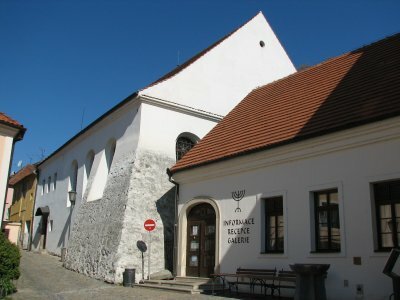 Trebic's Jewish Quarter is the most representative in its kind in Central Europe, It is considered the most complete, including synagogues, Jewish schools, a hospital and a factory. The quarter has a characteristic condominium structure: there were often several owners in one house and buildings were internally subdivided. 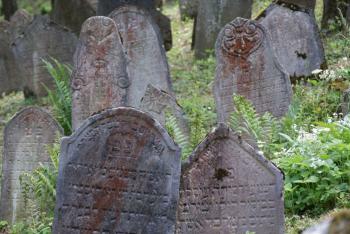 Above the Jewish Quarter is the Jewish Cemetery, consisting of about 4000 tombstones. All Jewish inhabitants were deported in WWII, nobody returned. The last day of my stay in Moravia I had only a few hours left before my return trip to Amsterdam was due. Those hours proved to be well spent in Trebic, a small town about an hour west from Brno. Like Ian Cade (see review below) already noticed, the attractions of Trebic are very well sign posted. Because of its compact size it's also an easy place to go around on foot. First I headed to the St. Procopius Basilica. The interior of the Basilica (and the nearby museum) were closed because it was Monday. So I just had a quick glance. The WHS nomination document supplied by the Czech authorities calls its architecture 'bizarre'. 'Ecclectic' would be my description. The best overall view of the church can be had from the first bridge that connects the Trebic city center with the quarters at the north side of the river. The (former) Jewish Quarter is located at the foot of the Basilica. The different parts of the Jewish community (synagogues, school, town hall, houses) all are clearly marked and have found new purposes. It's the relatively peaceful coexistence between Christians and Jews until WWII that has gotten this site a place on the WH list. In that way it's more of a tribute to urban continuity than to a specific architecture of a certain era. Many of the buildings in this quarter have been (partly) rebuilt in the 19th and 20th centuries. This is a film I made about the town Trebic in the Czech Republic (Swedish voice-over with English subtitles). For me the newly restored, pastel coloured buildings of the Jewish Quarter seemed unreal. Looking at the unrestored buildings it was difficult to believe that they had ever had the clean lines and pristine appearance of the restored ones. The ornate entrance to St Precopius' church was far more real. The Jewish Quarter of Trebic got its inscription mainly because it is one of the most important and well-preserved Jewish quarters in Europe. The inclusion of the St Procopius Basilica illustrates the coexistence of Christian and Jewish cultures over the centuries. I agree with the previous reviewers that the inscription is justified and also that there is not much to see from a simple tourist point of view. 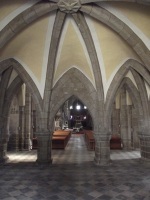 A visit of the basilica is worthwhile though, in particular because of the beautiful Romanesque vault in the crypt. The "guided tour" turned out to be a two-sided text-sheet and we could visit the basilica accompanied by a guide. However, the guide answered all our questions and we could take photos, although that's actually not allowed. The (formerly) Jewish Quarter is located at the foot of the basilica, on the river bank opposite to the Christian town centre. Most houses have been renovated and are well preserved, as the buildings at the entrance of the quarter, the former town hall and the two synagogues. Others, like the poor-house, are still in bad condition. In particular the Rear Synagogue is worth a visit, the thick walls and pillars are striking. The interior is decorated with wall paintings from the 18th Century. A special feature is the women's gallery in the upper part, that could only be reached by a staircase in an adjacent building. For me, the best part of the site was the Jewish cemetery (photo). On the way uphill to the cemetery you have a beautiful view of the basilica. The older, rear section of the burial ground is located on a steep slope. The gravestones stand close together in the grass and between ivy. The oldest part of the cemetery is from the late 15th Century, the oldest gravestone with a legible inscription dates back to 1625. Beware that the cemetery is closed during the Sabbath (from Friday to Saturday evening). I have been many times in Tøebíè, dominated by the big basilica of St. Procopius (13th century), constructed on a hill as the church of a benedictine convent reconstructed after the destruction in the actual Renaissance castle. The basilica is a large Romanesque and Gothic building, built in granite and rogh and irregular sandstones with triple choir, three naves, an elongated presbitery with an apse that has a beautiful window and a nice gallery, a porch with a beautiful portal, a crypt with rib vaults and a chapel with frescos. The Gothicizing Baroque front with plaster rendering reconstructed by František Maxmilián Kaňka is in the same style like the interior. 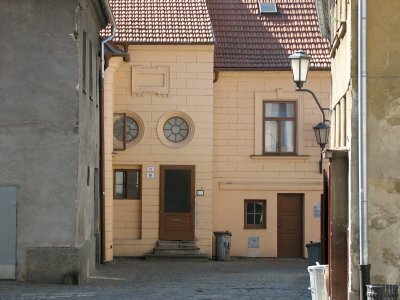 The jewish quarter is situated between the river Jihlava and a hill and had only a separation until 1875, when the Jews moved out and the area remained in the hands of the poor. It has two beautiful main roads, on different levels, and small alleys. The small houses (Renaissance or Baroque but more frequently later), have often an alley going through them, a vaulted ground floor, one or two upper floors with wooden ceilings. They were organized in condominiums: there were several owners in one house and could change their part of the building; on the street level was often a shop or a workshop and the others were used for living and had few services. The houses were often linked so some of them have no entrances or have them on different levels. There are also two sinagogues (one is in baroque style), the town hall, the rabbi's house a school, the hospital, a poor people's home and a leather factory. On the hill is the vast jewish cemetery, divided in one part of the 15th and another of the 19th century, that contains about 4000 typical tombs with hebraic inscriptions and carvings and a ceremonial hall (1930). I liked very much the basilica and the jewish quarter because of the beauty of the first and because I have never seen a jewish quarter as nice as this; however the state of preservation of the houses is often bad, because they are owned by poor people. It's worth to be visited if you are in Moravia (if you go there you can visit the basilica only with guided tours and you must leave the car out of the jewish quarter) and justifies the inscription also because the jewish quarter, apart from Israel, is the biggest in the world and because there aren't many monuments of this type on the WHL. The Jewish quarter here is quite small but uniform. It doesn't seem too different to many other older outskirts of Czech towns, but the subtle Jewish historical aspects are all well highlighted. The Rear Synagogue has been restored in the past ten years and has some nice decorations inside and interesting exhibitions on Jewish life and the Holocaust. This whole area was actually going to be razed under the communist government to build high rise "panalak" housing but local objections saw that this didn't happen. Sv. Prokop Basilica (pictured) is on a hill opposite the Jewish quarter and has some reasonably interesting architectural features, however I think it was added more as a way of getting the site inscribed on the list than for being particularly "outstanding". That said the tour did give a chance to explore the impressive Romanesque vaulting of the crypt. Although it glosses over many of the more tense parts of the history of the two communities the inclusion of both Jewish and Christian heritage is designed to show how the two communities lived (mostly) peacefully with each other from the Middle Ages up to the 1939. Whilst this may not be the most impressive WHS it deserves a commendation for making the most out of its place on the list. There are sign posts everywhere, information is posted on all buildings of note in four languages and there are about five interactive talking message boards scattered around the site. Also the tourist office has produced a fantastic, if slightly optimistic, book on its potential as a base for exploring UNESCO sites in the area (Telc and Zelena Hora are only at most a 45 minute drive from here). Also it has an excellent tourist web site (www.trebic.cz/unesco). So it deserves top marks for embracing its status as a world heritage site. I was only planning to stop here for about 45 minutes or so but there was enough here to keep me occupied for a few hours. It is easy to reach from Brno and there are direct trains to Prague. Trebic is a pretty, but relatively little-known city west of Brno that hasn´t seen much tourism before it was added to the WH List in 2003. The reason for that is the Jewish Quarter, which is one of the most important (historically speaking, for obvious reasons) and best-preserved in Central Europe. It´s also the only WH site with a Jewish subject outside of Israel. That´s all important, and Trebic probably deserves its place on the list for that, but to be honest, there´s not that much to see there. The former ghetto is nice to walk through, but the Jewish traces are not really very obvious (but, as stated below, well signposted). That´s also because of obvious historical reasons, since the Jews didn´t want to attract too much attention, but for today´s visitor, it doesn´t hold much obvious appeal. What is definitely worth a visit is the peaceful Jewish cemetery a few hundred metres up the hill, where the tombstones in three languages tell the story of the coexistence between the religions better than the Jewish quarter below. The nearby St.Procopius´ Basilica is also included in the site, but it doesn´t really have anything to do with the Jewish aspect of it. It is a nice and interesting building, though. Visiting the city of Trebic was an impressive experience. The Jewish quarter is partly renovated, and the sad feeling about the Holocaust also in this Community, with only a few survivors gives a deep impression of horrible times in a very nice surrounding. The Synagoge is in a very good condition and covers a small museum. Interesting also the Benedictine Monastery and Church of great importance close to the Jewish Quarter, a neighbourhood without problems over centuries, ended only by the Holocaust. Very good, multilingual infoboard at the city's main square. Nicely painted and decorated houses in the city centre. My visit was on August 14, 2003, and Trebic is very well signposted on the roads. 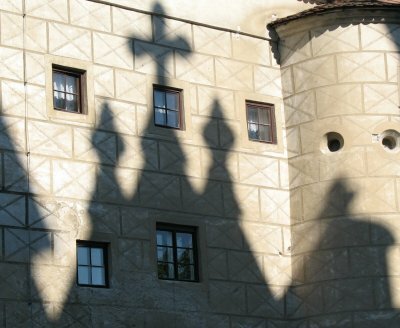 Built in the 12th century: OUV lies in the cultural coexistence between Christians and Jews over many centuries: "A Benedictine Monastery was founded in a strategic position at the crossing of Jihlava River, in 1101. Its existence stimulated the establishment of a market, which brought traders and amongst them also Jews."